Long time fans of Tom Petty can be excused for thinking the show of two Wednesdays ago at the Sports Arena was a little, well, subdued. Compared to his show four years ago -- if that's fair -- last week's concert was surprisingly low key, without any of the elaborate stage settings, chandeliers or giant trees which made his previous tour such a visual as well as an aural banquet. But being the American institution they are, Tom Petty and the Heartbreakers can afford to make the rules. Their set, which drew long and hard from the new album, "Wildflowers," featured the band with little more than a few candelabras perched behind them and Persian rugs beneath their feet. New material, most particularly songs like "Time To Move On," and the Dylanesque harp of "You Don't Know How It Feels," dominated the better part of the first half of the two-hour show. 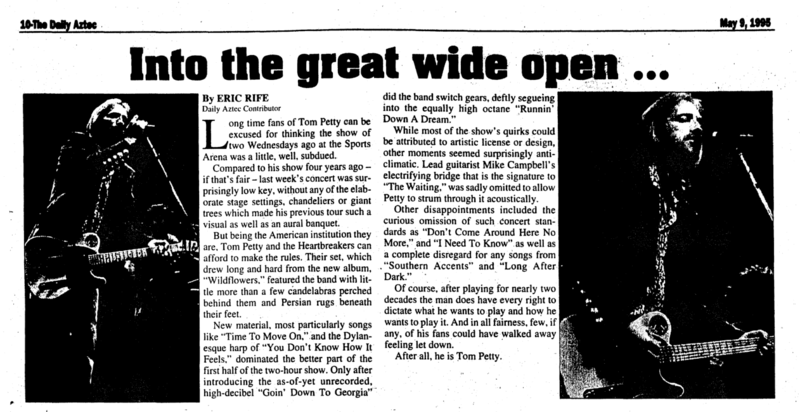 Only after introducng the as-of-yet unrecorded, high-decibel "Goin' Down To Georgia" did the band switch gears, deftly segueing into the equally high octane "Runnin' Down a Dream." While most of the show's quirks could be attributed to artistic license or desgn, other moments seemed surprisingly anticlimatic. Lead guitarist Mike Campbell's electrifying bridge that is the signature to "The Waiting" was sadly omitted to allow Petty to strum through it acoustically. 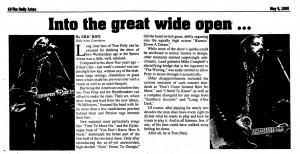 Other disappointments included the curious omission of such concert standards as "Don't Come Around Here No More," and "I Need To Know" as well as a complete disregard for any songs from "Southern Accents" and "Long After Dark." Of course, after playing for nearly two decades the man does have every right to dictate what he wants to play and how he wants to play it. And in all fairness, few, if any, of his fans could have walked away feeling let down. After all, he is Tom Petty.